Comcast Company is identified for its widely used cable and internet service provider in the USA. It does not only offer flawless internet but also cable services. Comcast internet speed an average 105 Mbps. This is certainly the fastest in the entire country. To installing and setting up a Comcast is not a big deal. However, at some instances, users face some random errors while trying to set up their Comcast device. The user who didn’t have any technical knowledge does not do anything. One of such error is the s0A00 error. This error comes frequently and is encountered by a lot of Comcast users globally. So, today we are going to tell you how you can fix it by yourself. All you have to just simple step and your error will be resolved. One of the first solutions that you can try to fix thes0a00 error in a Comcast box is to reset your cable box. Sometimes these error comes by some random reason. By resetting your Comcast box it will automatic resolve. To reset your box fallow this:- First of all, unplug your adapter and wait for 1-2 minutes and press the button of reset and wait for 10-15 min. Then plug-in the adapter back and then start-up the box. The Comcast ref code s0a00 error should be fixed by now. If you have installed it very well and after that you are facing comcast code s0a00 error. It could be the reason of your faulty cable. According to experience, resetting the cable and box will help you fix the error. In order to reset the cable box, you must fallow the above given method and check the cable if it is dameged from somewhere. After checking if you found any damage the call at servies and they change the all cable for you. After that you won’t face any kind of error. Some time this error cause of the coaxial cable of your setup box. To reset your coaxial cable, power off your setup box and tv and now remove the coaxial cable from the cable box and TV. Now, replace with the new cable and check the coaxial cable is damaged or have aby cut. If didn’t then fitted correctly and tightly to the wall. Now check you tv the error must be resolced from there. Step 4: Enter your Comcast account #, or the last 4 digits of your Social Security Number. It’ll ask you to make sure everything is plugged in and turned on… then press 2 when its done talking. I hope the error is resloved by now. If not then contact with expert help. Guys these are the best methods to solve the Comcast ref code s0a00 error. You don’t need to worry about anything, your are not the only one who is facing this error. 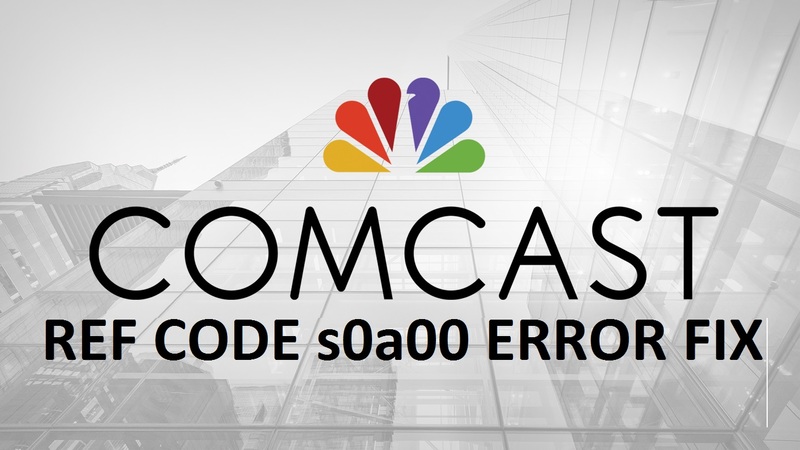 If the comcast ref code s0a00 error appears on your TV screen. This is a very common problem faced by many user. Share this with your friends so they can also try these methods and if you have anyother method which worked for you, then share with us through comment section.